This week Jonathan Denwood and co-host Kim Shivler interviewed Chris Badgett of LifterLMS (https://lifterlms.com). Chris has been a guest before and often joins us on the WP-Tonic Friday Round-table shows. This week, we talked about what’s on the horizon for LifterLMS and tips for creating successful online learning programs. LifterLMS is creating new, expanded options for quiz types which will make their quiz engine more robust and give teachers more options. The are also adding assignments and working to incorporate assignments that take place outside the computer. This promises exciting possibilities for people who teach topics other than technology. For example, cooking or hobby instructors could teach skills that students then must practice outside the LMS and report back. Jonathan: Welcome back folks to the WP-Tonic Wednesday show. We’ve got a fantastic guest on the show today. We’ve got the Joint Founder and CEO of LifterLMS, Chris Badgett. He also comes on our Friday Round Table show. So he’s a friend of the show. Like to introduce yourself a bit more Chris? Chris: Sure. It’s good to be here Jonathan. I do a lot of different things. I’m a family guy. I’m a traveler. I’m an outdoor guy. I’m a technologist. I’m a prolific online course creator myself. I’m really passionate about online courses. 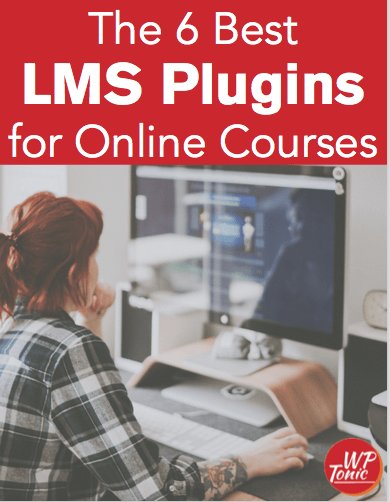 But most people online know me as the Co-Founder of LifterLMS which is a WordPress plugin and ecosystem of add-ons that make it possible to create, sell and protect online courses. But I’m into all kinds of things. Leadership, family, healthy lifestyle. All these things make me tick. Jonathan: Certainly does. And I’ve got my co-host Kim Shivler. Like to introduce yourself, Kim? Kim: I’d love to. Thank you, Jonathan. I’m Kim Shivler. I am an Instructional Design Consultant and a Communications Instructor. You can find me at kimshivler.com. Jonathan: That’s great. And I’m the founder of WP-Tonic. We’re a maintenance support company that specializes in Learning Management Systems and Membership websites. That’s what we like to help people with. So, let’s get this show started. 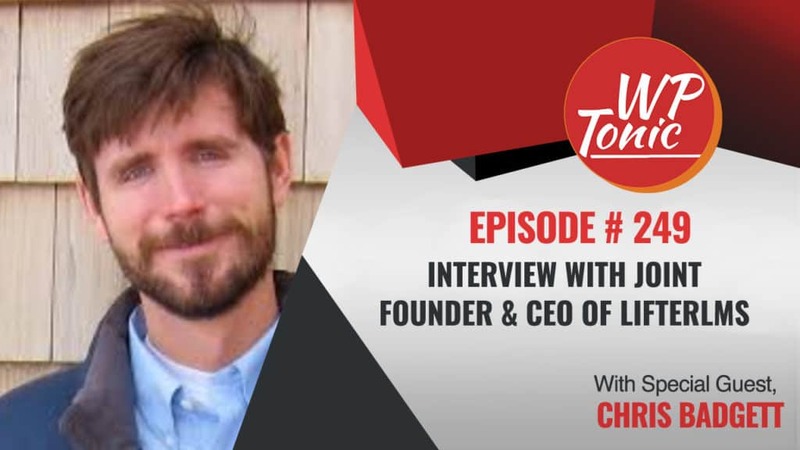 So, Chris, with Thomas, your other Joint Founder, how did LifterLMS start? What was its origins? Why did you get into the crazy world of Learning Management Systems, Chris? Chris: Well, I like to say, just like the Hair Club for Men, I’m not only the CEO, I’m also a client. So, I’m a course builder myself which is part of the origin story. But to give a broader context, we’re recording this at the end of 2017. The LifterLMS project is almost 4 years old at this point. Thomas and I operated a WordPress, Web Development and Design Agency a long time before that for several years and we knew we wanted to get into the product business. We enjoyed serving clients and we ended up getting a specialty in building online courses and membership site websites for people and then often building custom software on top of that, all doing that in the WordPress ecosystem as the foundation of our development stack. But it was through all that. Wanting to get into the product. Me understanding the industry because I also create and sell my own online courses and partner with other experts to do the same as kind of a publisher model. It was just the obvious choice of where we wanted to go. I’m a big fan in terms of Entrepreneurship and business. Someone came up with a phrase, the corner office test or the stage test which means, “Do you want to, 3 years from now, be on stage talking about this? Will you still be passionate about it? And if so, it might be worth pursuing. If not, the fire of passion may burn out and it may not hold long-term”. But for me, online education and the topic of learning is something that I’m literally devoting my life to. So that’s part of the story as well. Jonathan: So, how did you meet Thomas? Chris: Thomas and I met when I first got into technology, I had just left Alaska. I spent a lot of time of my life living without technology and even without electricity. After I had my first daughters and we can talk about the Alaska origin story if you want a little bit. But I was actually freelancing for another company doing Project Management for Web Development and I hired Thomas for a freelance Development job. I found him on oDesk it was called at the time. Now it’s called Upwork. I kind of developed him as a sub-contractor in this other company. Then I started my own freelance business. I hired Thomas as a sub-contractor for me directly. And then later, Thomas hired me as a Project Manager into this company. And then later, we’re like, “Let’s just end all this. Merge our companies together”. And that was the origin of codeBOX which is officially the company that makes LifterLMS. We used to do a lot of client services but now we’re fully focused on LifterLMS. Jonathan: Oh, that’s great. You broke up a little bit there but you came back, Chris. Like you say, it’s been 4 years. What are some of the major lessons that you’ve learned in those 4 years, Chris? Chris: Wow. There’s a lot. The big one is, kind of like I mentioned with the stage test. Having passion is so critical to our success. Because we’re really into the subject matter of what our software does, we’re not just trying to make money with an Internet business. It’s that passion that not only fuels us through the difficult times but also is one of the number one attractors of people who become interested in our product because they can see the excitement and the passion that we have as a company and how much we get invested and how much we listen to our prospects, our users and our customers and really care about serving what they’re trying to do. It’s one of our unique selling propositions, differentiators. That’s a big one. Another one I would say is just having an open mind and being open to having our assumptions challenged. So, if we are building a feature, we ask for community feedback. Maybe they want something slightly different than what we were originally thinking. We’re okay with that. We’re not building this for us. We’re building it for them. And I’d say our biggest insight is we take care of our customers and our users. But what we focus most of our attention on is our customer’s customer. So, our customer who’s teaching online, as long as their student’s or their members are taken care of and get the results that they’re trying to get through this online course or membership site, that is the guiding force and principle behind everything that we do. And having that focus is a big part of our success. Jonathan: Yeah. I can honestly say I think you and your team plus the Beaver Builder and the team are some of the nicest people I’ve met in WordPress actually. And like I say, I think all three companies have the same kind of philosophy and really do the best for their clients. So, I’ve put you on a high level there Chris. Chris: Well, I appreciate that. And I know those companies too. Yeah. I really appreciate that. Jonathan: So, how do you, you know, in a crowded market, not only in the WordPress space but a lot of totally hosted solutions, how do you differentiate LifterLMS from the competition, Chris? Chris: You’re absolutely right. There’s two questions there. The first is . . .
Jonathan: Oh, I’m known for my multi questions Chris. Chris: You’re right. The first question if someone asked and I will do this. If I’m talking to somebody and if they’re not a good fit for being self-hosted or owning their own platform, I will recommend a hosted solution like Teachable or Thinkific. But that is the first question someone needs to ask themself is, “Do you want to own your platform? Do you want control over that? Do you want to avoid monthly expenses? Do you want to tap into the power of the WordPress ecosystem with all the other plugins and design and unlimited customization that you can do? Or do you want to rent space somewhere else with limited customization with the benefit being that you’re not responsible for the platform?”. So there is a tradeoff. When you own your platform, you are responsible for it and you’re taking on more technical responsibility. But that’s the beautify of WordPress. It’s made for, in terms of democratizing, not just publishing but also application development. And when you’re building an online course and a membership site, make no mistake about it. It’s not just a website. It’s not just some marketing pages. It is a web application. And LifterLMS is a tool for building a Learning Management System which is a web application. So, once you make that distinction, there’s so much competition inside hosted Learning Management Systems and membership tools that you just take like 95 percent of everything off the table and you’re speaking to people who want to own their platform. They want to control the revenue. They don’t want fixed monthly fees. And they want extensibility and freedom to build their platform. So that’s the first thing. Now that we’re in the WordPress space, the next question is WordPress LMS plugin versus WordPress LML theme? In my opinion, design belongs in themes. Functionality belongs in plugins. You should be able to change your design and not lose your LMS, is an example. Most people change their website every 2 years, the design but they don’t need to lose the Learning Management System they worked so hard to build. So that takes a lot of the themes out of the way. Now we’re left with a handful of WordPress LMS plugins. And really the big differentiation for us has to do with our levels of customer support, our levels of engagement with prospects, users, and customers. Has to do with our vision for product and it has to do with our focus on creating, not just selling information but creating a tool for people to offer results based learning. What people say they like a lot about us is just how much we listen. Like I was talking about before, we don’t operate in a bubble and assume that we always know what’s best for online course creators and membership site owners. We’re very engaged in our Facebook group, the Conferences, in other Facebook groups, other online formats, always listening and interacting, making sure we’re serving the needs of the course creators. So it’s counter-intuitive. We actually do very little market research in terms of looking at our competitors. I haven’t used a competitor’s tool in my 4 years. I’m not focused on my competitors. I’m focused like a laser on course creators, membership site owners and their business problems and the needs of their students. And it’s through there that we guide the vision for the product and I think people really like that. And once they get that and they see that, it sways a lot of people to wanting to be on the journey with us. Jonathan: Yeah. I think that’s great Chris. Because I think what you’re saying is it’s a bit like, what is the differential of one of your clients who’s competing in a competitive membership sector is that the actual teaching experience and service care of those that join the members can be a differential. The other thing I want to ask you about it UX Design because like you say, you are actively in your plugin application platform. Have you learned a lot? I think really good UX Design is not easy. Has that been a thing that you’ve struggled with and learned from? Chris: I really love that you’re asking that question. First of all, I would say something like just to kind of back into that. Sometimes I wonder like, “Why did we get into Learning Management Systems? It’s really complex. It’s complicated. There’s all these other products that are like, we’re just going to do one thing like get on opt-in or submit some forms”. Learning Management is complex. But we’re okay with that because we love it and we’re passionate about that. But that comes with all these different interfaces. And not only is it for the builder of the website, it’s also for the teacher. It’s also for the end user. So there’s all these different layers to what the interface means. And I would say over time, I was actually really appreciating that skill set that has evolved for myself and Thomas and other members of our team over time just from all those thousands and thousands of hours developing software and solving business problems with software. We’ve developed that skill set. And they exist out there like a user experience design training program or school. But Thomas and I have kind of evolved through that more through more of an organic way of like, “Okay. We’ve got this business problem we’re going to solve and let’s work together”. He’s really open. I’m representing the end user. We’re talking through it. Just recently, yesterday and several days this week we’ve been designing the new quiz interface which is going to have a whole new overhaul. All these new question types. The way a course creator builds the quiz is going to get 10 times better. The student experience is going to get 10 times better when they’re taking a quiz. There’s going to be all these different kinds of question types to make the learning engagement much higher and quite frankly, a lot more fun and game-like. And skill has evolved over time. And I feel grateful that we’ve had the opportunity to stay with the same kind of project for so long. That ability to do interface design especially in the LMS world is becoming another one of our assets or differentiators. But I just feel blessed to work with somebody like Thomas where we have different skill sets to work on that user experience problem. And then, the whole other piece of it which I’m looking to interact with and help more instructional designers or just to understand that world even more. I’m open to learning a lot. I’m trying to connect course creators with more instructional designers because we have all these experts. I’m helping build the tool. And now we have this whole other interface of like, “How do we build the actual course content and the learning journey?”. There’s just so much that goes into it in this world of learning that it’s an endlessly fascinating fun and collaborative experience. Jonathan: Just a quick question before we go for our break and I turn it over to my co-host Kim. Do you think increasingly, not only your own product but other WordPress LMS products, do you think you’re going to get an increasing foothold in the professional education, universities, schools market as well? Chris: That’s a great question. Jonathan: I’m doing well, aren’t I Chris? Chris: Yeah. From what I’m seeing, from the outside looking in, I’m a believer that we’re still in the early days of the hockey stick growth of online education. We are starting to tip into the majority and things are starting to go mainstream. But the bread and butter of the LMS industry, especially the self-hosted LMS industry which we talked about, right now has to do with experts and solo operators but it is becoming more institutionalized. More businesses are adopting LMS for internal training. There’s people using LifterLMS, college professors who are using it to deliver. Instead of giving books to their students, they’re giving courses powered by LifterLMS to their students. There’s all these things I see happening. Universities contact me, departments. This is the beginning of the tip into the mainstream. But the early adopter, make no mistake about it was the technologist and the marketing expert looking to teach online. After them is other kinds of solo experts. After them, we’re getting into the businesses and the institutions and the majority. Jonathan: That’s great. We’re going to go for our break and we’ll be back. And we’ll be discussing more about Learning Management Systems with Chris Badgett, the CEO of LifterLMS. Male Voice in Commercial: Do you want to spend more time making money online? Then use WP-Tonic as your trusted WordPress Developer partner. They will keep your WordPress website secure and up to date so you can concentrate on the things that make you money. Examples of WP-Tonic’s client services are Landing Pages, Page Layouts, Widgets, Updates, and Modifications. WP-Tonic is well known and trusted in the WordPress community. They stand behind their work with full, no question asked, 30-day money back guarantee. So don’t delay. Sign up with WP-Tonic today. That’s WP-Tonic.com. Just like the Podcast. Jonathan: We’re coming back. Before I hand it over to Kim, I want to talk about one of our sponsors. It’s a new sponsor. I’m really glad that they’ve come on board with WP-Tonic. They’re going to be with us for over a year and that’s Kinsta Hosting. What is Kinsta? Kinsta is one of the best quality WordPress hosting providers on the market at the present moment. The WP-Tonic website is hosted by Kinsta. I wouldn’t endorse them unless I was utilizing their product myself. They’ve got a great team. Very similar to some of the companies that I’ve mentioned in this Podcast. This particular episode. They’re a fantastic team. It starts at $30 a month, their plans. Basically, they’re using the best technology on the market at the present moment. I would highly advise you to go to kinsta.com and look at what they’re going to offer you, the WordPress business owner or the Developer. So go to kinsta.com. So, I’m going to hand it over to my co-host Kim now. Kim: Thanks, Jonathan. Great stuff as always Chris. We always love getting to chat with you. So, I had a couple questions. And I love what you said about the quizzes because I think that that was something you guys have done, in my opinion, a really good job of. You started small to get it out the door. And now you’re really adding on to that. Because that was, I think, in my very first review was the quizzes were a little limited compared to some of the others. But now, it’s just been fun watching you over the last year and a half really growing into that. So other than the quizzes, tease us with something else you’ve got coming out. Chris: Well, right after quizzes is our assignments functionality. And this kind of ties into our vision of mapping, not just information, selling information, curated information, but results. And the way we’re approaching assignments is all about helping course creators take their learners outside and away from the computer or if it is on the computer, that’s fine too, but to get the results that they’re teaching about through an assignment system that really helps reinforce and apply the learning. So I’m super excited about that. And thank you for the kind words about the quizzes. Yeah. We wanted to build our own quiz system from the ground up without bundling in a third party quiz system. I’m really excited because it has been a long road getting to this point where now we can really focus on that and build on that foundation without any dependencies for the market. So I’m super excited about that. Kim: That’s fantastic. So I love the assignments idea. Many times I’m teaching technology which is assignments that happen on the computer, but I also, we know, teach communication skills which has teamwork that is completely outside of the computer. So the fact that you’re approaching that. I have not seen another online management system give you really any other ideas for assignments other than, “Create a document and upload it here”, type of thing. You can kludge it together. Those of us who teach, we can make anything work in our own mind. But I love that you are coming at it from that. Another thing that you’ve recently added and I’m just getting to start playing with it here, is some private options for your students. So if I’m teaching, which I am about to launch a new series of classes that will be in LifterLMS, I can actually have private pages for my customers. Tell me a little bit about that because I think that’s something a lot of people are interested in and they don’t even know it’s available. Chris: Absolutely. So, before the advanced quizzes and what we call our Infinity Bundle, we rolled out two add-ons which are advanced functionality. One is called Private Areas and one is called Social Learning. So the one we’re talking about here, Private Areas, is built for coaches and one on one mentoring. And again, this all comes back. If we zoom out and look at the vision, we’re focused like a laser on the results capability of the platform on the students. And if you look at the offline world which is where I go for inspiration, if you have a course, a class, a book, what makes it more effective, it’s one and one access to the leader where learning can be personalized or private coaching. Different people have different limitations, stumbling blocks, strengths, and weaknesses. So, Private Areas is built basically for people who want to offer one and one coaching as either an upsell to their course or as part of their main offering. And at a tactical software level, it is a private page per student per course or per member per membership. That sounds cool but it’s what you can do with that and it’s not just one page. You could do a series of it. It’s kind of like a personal blog. You could just have one private post or you could have multiple and then there can be a private conversation around that private post. As a coach or a teacher or a mentor, you can do so many different things that private channel to facilitate more on top of just the course content and the gamification. I don’t mean a $29 course, but a good expensive course, they want a little more access. So, even if you don’t consider yourself a coach, think and look at what you can offer people in these private areas. Even if it’s not something you’re assigning them, but a place for them to process and keep their notes etcetera, it can be their private area. It doesn’t mean you actually have to go into each person’s page and give them individuals, correct? This can be like their private locker where they can process their notes and what does that do? That adds to the interaction. It adds to the learning experience. Chris: Absolutely. That’s very super solid points. I’d like to also just point out the economics. Like you’re saying, the days of a $2,000, a $1,000 passive course, it may not work going forward. And I think in our society, there’s a love affair, which I have too with automation and passive income and I’m not against those things and I do those things. But I think the hidden gem or what’s the hack, is to do things that don’t scale. So when you’re considering building a coaching program or a learning program, if we just do SaaS Math which is like a dangerous way to look at numbers but it’s fun to do. You may create a $100 course. Say you’re trying to get to the $100,000 a year mark, now you’ve got to sell 1,000 units of your $100 course which is passive income and all that. I would argue, it’s easier in this world, this day to add private coaching to that offer which has some one and one. Let’s say it might have some Zoom or Skype calls and then those replay videos go into the private area, there’s conversation and what not. It’d be easier to sell 100 of those for $1,000 or let’s say 50 of those for $2,000 than to get to the $1,000 of the video version of a book. Kim: Hands down. That’s exactly what I’m seeing. And as always, for anybody who hasn’t heard us get together yet, every time I get together with Chris we could just keep geeking out on this stuff because our minds go the same way but we’re seeing the same things. Yes, when I first started teaching people online courses several years ago, you could do some of these more automated at a higher price. Now, if you want to be fully automated, you’re going to have a lower price. You also have the benefit of, which the higher price courses and the SaaS Math as you said, very much like something you said already. Part of what helps drive your company and where you go next is listening to your customers. You do yourself a favor also. If you offer some level of group coaching, personal coaching etcetera. Because if you will listen, they will tell you what they want next and what they’re willing to pay for next so that you can keep feeding your own audience. And I think that’s something that I was hearing you say is very much part of what you guys do. Chris: Yeah. I think it’s counter-intuitive. I think we’re really used to picking up a book and not being able to contact the author of the book. But the rules are different in the online world. You can create stuff and the people can contact you and you can charge much more than $10 or $20 for a book. So the economics can work out. And having that feedback loop open is critical to results based learning. Kim: Yeah. Absolutely. Jonathan, did you have something?